Red Book Magazine, while ostensibly a fiction journal targeted to female readers, published many of the finest fiction stories of the era. Much like Colliers and The Saturday Evening Post, the magazine often introduced rising stars in the literary world. 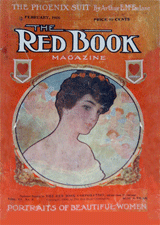 From 1930 on, Red Book Magazine changed its name to Redbook Magazine. Redbook's stories ran the gamut from romance serials to mystery dramas and adventures to light comedies. Redbook's traditional fire engine red covers represented some of the most beautiful illustrators' art of the era. The solid red covers eventually gave way to other themes in the early 1930s, though red continued to remain the predominant color theme. 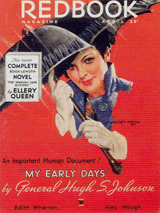 In 1931, Redbook Magazine's Editor, Edwin Balmer, negotiated a series of twenty-six, transcribed dramatizations of short stories from Redbook Magazine. We know that the series was transcribed in 1931, because a young Florence Halop, sister of Billy Halop, and later fondly remembered as Bailiff Florence Kleiner in Television's long-running Night Court (1984-1992) appears as 'Betty'. Florence Halop is announced as having turned 8 years old the day of the recording. Florence Halop was born on January 23, 1923, which would date the recording session of the Redbook Drama episode, The Kid, to January 23, 1931. We can therefore reasonably assume that the series began recording between late 1930 and early 1932, assuming Ms. Halop didn't fudge her birth date. Dating the actual broadcasts or their original recordings has been something of a detective story of its own. NBC Blue first aired Redbook Drama in 1932 over its affiliate KWK. Only a handful of the titles for that run, usually broadcast late Saturday afternoon, were announced in the newspapers. The series was often replaced with other NBC Blue offerings. The only other outlet we could find airing the series was in Texas, a Sunday run beginning in the Summer of 1932--again with only a handful of announced titles. Both the announcer and Edwin Balmer, Redbook's Editor, cited the broadcasts as reflecting stories from then current issues of Redbook Magazine. And indeed, about half of the recorded series of stories did come from then current issues of Redbook. 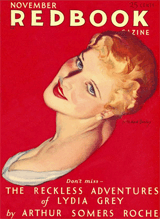 The other half of the stories were published in Redbook as early as 1930. Apparently the announcer and Mr. Balmer felt justified in exercising a bit of literary license in the announced ties to current issues of Redbook. Edwin Balmer, beyond serving as the Editor for Redbook Magazine was also a prolific writer himself, specializing primarily in Science Fiction stories. Nine of of his stories and novels were translated into Films, most notably, When Worlds Collide (1951). When Worlds Collide has been updated and is currently under production for a 2010 Film release. Balmer announces the stories throughout the Redbook Drama series, as well as providing a bit of exposition on the history of the stories and their authors. 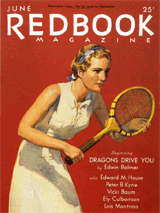 By 1930 and beyond, Redbook Magazine was becoming as popular as Colliers and The Saturday Evening Post. The magazine attracted many of the better fiction authors of the era. It comes as no surprise that many of the stories selected for the series hold up quite well to today. 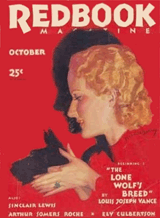 Many of Louis Joseph Vance's 'Lone Wolf' stories were introduced in the pages of Redbook. Edgar Rice Burroughs also wrote for Redbook along with Sinclair Lewis, Ellis Parker Butler, Roy Cohen, Paul Gallico, F. Scott Fitzgerald, Booth Tarkington, Lord Dunsany, Rube Goldberg, and Frederic Dannay & Manfred B. Lee, better known as Ellery Queen. The selections for Redbook Drama comprised adventure, mystery, western, and comedy fiction. The canon holds up well. The dramatizations, albeit edited for a twelve-minute format, were well performed, well directed, and, for recordings from the early 1930s, preserve a great deal of fidelity. Redbook's fiction stories were an ideal source for Redbook Drama's fifteen-minute format, as engaging today as they must have been during Post-Depression America. At 10 o'clock another dramatized story from Red Book Magazine. This is "The No Man." Red Book drama will be moved out of its 10 spot tonight and will be heard at 5:30. At 10 the Red Book Drama, "Tribal Law." At 10 another dramatized story from Red Book Magazine. At 10 the Red Book drama, "Zulie," in a dramatic story from a recent issue of the Red Book Magazine. Due to failure of the power lines last Sunday night we did not broadcast the Red Book drama of "Zulie." Consequently that will be the dramatization for tonight at 10. At 10 o'clock KFUL presents the Red Book Drama "A Gent Passes By." We heartily recommend this to be very entertaining. At 10 the Red Book drama "Hate and Twenty Cents," a mystery drama that will grip you from its very beginning. It is the story of an amateur detective who was not a detective but was clever . . . Very clever. 10:-- Red Book Drama--"You Have To Have Something." The title of this popular program for this afternoon presented by the Red Book Drama players will be "A Gentleman Passes By." It has been requested that this drama be repeated, a reprint as it were. It is one of the finest examples of the Red Book players art. Another of those popular Red Book dramas. The title of this week's mystery drama is "Under the Midnight Sun." KFUL presents another Red Book Drama at 10 titled "Villigante." Another of those mystery Red Book dramas at 10. This week the mystery drama is titled "Rubbed Out." KFUL presents another in a series of Red Book Dramas, bearing the title "Conqistador"--a story of a gallant man and a lovely woman. From the title we would suppose that it is set in the land of Manna south of the Rio Grande--a land of romance. However, we shall see. REDBOOK DRAMAS ARE POPULAR RADIO FEATURES Among the many popular features broadcast by radio station KFUL are the Red Book Dramas, which go on the air every Sunday at 6:30 p.m. Each of the dramas is based upon some story appearing in current issues of the Red Book Magazine. The play to be presented today is entitled "Ever So Slightly Careless" and promises a quarter-hour of excellent entertainment.